Looking for mental health counseling for senior citizens in Atlanta for your loved one may be just what he or she needs to start feeling good again. You know your family member or friend is struggling with the aging process and you want to help him or her the best way possible. The good news is that there are many resources for your loved one's mental health in Atlanta. Senior citizens who are in need of mental health counseling services usually suffer from emotional or behavioral problems due to some unfortunate life event or illness such Alzheimer's disease. As your loved one ages, he or she may start to see changes in appearance and mobility, which can be devastating. Furthermore, your family member or friend may have less energy or aches and pains keeping him or her from doing activities he or she used to enjoy resulting in feelings of hopelessness. The death of a spouse or a friend is why some senior citizens decide to seek mental health counseling. Grief counseling can be effective in helping someone through the mourning of a loved one. The symptoms of Alzheimer's disease, dementia, and other age-related illnesses are also hard on an older person. Someone who suffers from one of these illnesses may become agitated and aggressive. Your loved one may put him- or herself in harm's way because of irrational thinking and poor decision making. Counseling can help inner turmoil as well as help the person making better decisions. Individuals who are unable to handle physical changes and life events on their own may become depressed. This can cause your loved one to be irritable, angry, isolated, and unable to care for his or herself. Depression can also affect a person's ability to concentrate and focus on tasks, which could result in accidents causing harm to your loved one. You want to find quality mental health counseling for seniors in Atlanta for your loved one so you know he or she is getting the best in care. The good news is that Atlanta has some of the best mental health facilities in the country. Check with some of these online resources and then read on to find other ways you can find mental health services for your family member or friend. Consider a wraparound service for your loved one. Metta Johnson and Associates consists of care managers that are able to provide seniors with resources and assistance in their daily activities. Take a look at this site for a list of senior counseling resources in the Atlanta area. You will find information on the State Mental Health and Substance Agency, State Protection and Advocacy Agency, Family Support, Centers for Medicare and Medicaid Services, Advocacy Organizations, Georgia Mental Health Consumer Network and the National Alliance Mental Health Institute (NAMI) Georgia. The Atlanta Medical Center Senior Program provides counseling services to senior citizens age 50 or older. They specialize in many of the emotional and behavioral problems seniors face. Contact mental health counseling facilities for senior citizens in Atlanta that specialize in adult services. Many of these facilities will also assist seniors or can point you in the direction of specialized counseling in the area. Contact your local hospital's geriatric unit. Many hospitals have counseling services for inpatients as well as outpatients. Senior community centers may have a list of mental health services in Atlanta for your loved one. Don't rule out support groups as either an alternative or addition to individual therapy. Many times seniors feel alone and connecting with other going through the same thing may comfort them and help put things into perspective. Your friend or family member may not want to seek counseling because he or she believes there is a stigma associated with seeing a "shrink" or that he or she doesn't need therapy. You cannot make your loved one seek counseling because therapy is a collaborative effort between both the therapist and client. All you can do in this situation is encourage him or her to seek help and be there for him or her. 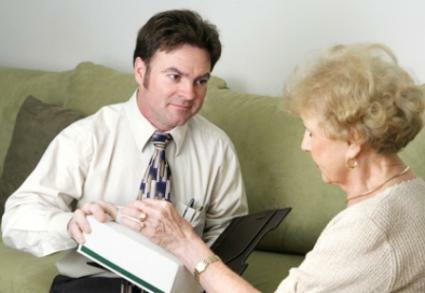 Offer to drive your loved one to the appointments or sit in on the sessions to help the person feel more comfortable. If your loved one still objects and is not a harm to him or herself or others, respect his or her wishes.